As a relatively new blogger with focus, I have been so excited to find a community of other KidLit bloggers. While trolling twitter yesterday, I found a number of bloggers posting with the hashtag of #pb10for10. 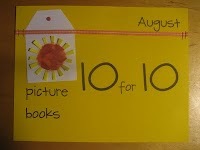 Apparently, the bloggers of Enjoy and Embrace Learning and Reflect & Refine were hosting fourth annual 10 for 10 Picture Books blog sharing event. People were sharing all kinds of lists with and without themes. So even though these were supposed to be posted yesterday, I had to get my list in. 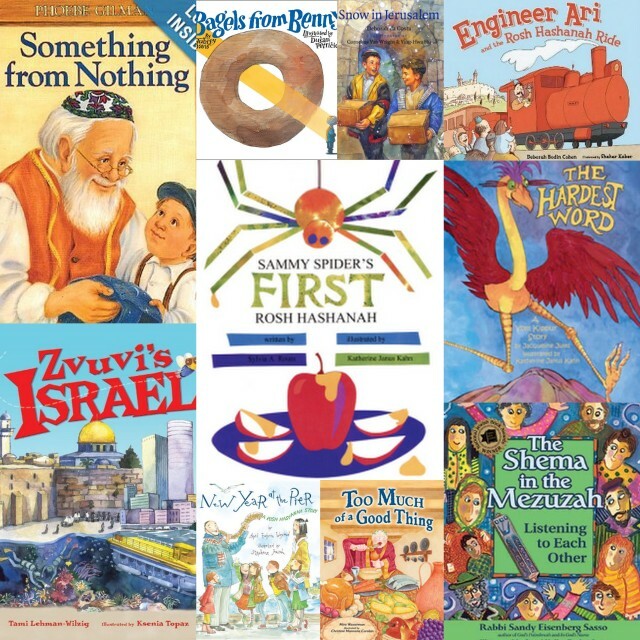 We are less than 4 weeks away from Rosh Hashana, so I decided to list my 10 favorite Jewish picture books that also have nothing to do with Passover or Hanukkah (they could get lists themselves). Many of these we received from the wonderful PJ Library. Something from Nothing by Phoebe Gilman is one of the first books that we got from the PJ Library, and it shows in its well worn pages. This is a wonderful retelling of an old Jewish folktale where a boy starts with a special blanket and when it wears out, his grandfather makes it into something new, until it is finally just a button and it falls off and disappears. At that point, his mother tells him that “even your grandfather can’t make something from nothing.” But the little boy creates a story. It is a great tale of the special relationship between a grandfather and child and I love how they keep finding new uses for something old and worn out. It has great repetition, which J loved when she was little, and beautiful artwork. There is also a cute second story below of a mouse family using the scraps as well. Bagels from Benny, by Aubrey Davis, is a beautiful story about mitzvot (good deeds) and tzedakah (acts of goodwill and generosity) while also tackling the tough subject of God. Benny tries to thank God for the bagels that his grandfather bakes by leaving a dozen in the synagogue. He believes that God is eating them, but it turns out that a man who was out of work was taking them believing them to be a gift from God. This book is a lovely way to teach children about Tikun Olam (healing the world). Engineer Ari and the Rosh Hashana Ride, by Deborah Bodin Cohen is a great way to explain the symbols of Rosh Hashana and how we are supposed to treat people in general. On Ari’s inaugural train trip from Jaffa to Jerusalem, he realizes the true meaning of Rosh Hashana and Yom Kippur and wants to do teshuvah – turn himself around and promise to do better. Great for kids on a variety of levels. The Hardest Word, by Jacqueline Jules is an important Yom Kippur lesson that saying you are sorry might be the hardest thing that you do, but it is also the most important. In this story, when the Ziz, a giant bird, knocks over a tree and smashing the vegetable garden of a group of young children, there is nothing that he can do to fix his mistake. When he asks God what he can do, God tells him that he needs to go out and find the hardest word. Ziz brings back a variety of words which are difficult for various reasons, but in the end, he says that he is sorry because he simply can’t find the word. God then tells him that sorry is the hardest word and that you can’t simply apologize on Yom Kippur, but you have to apologize for wrongs done throughout the year. I think this is a great lesson for the holidays as well as the rest of the year. New Year at the Pier, by April Halprin Wayland is another book about apologizing and the Rosh Hashana tradition of Tashlich. Between Rosh Hashana and Yom Kippur we apologize for things that we wish we hadn’t done and the ritual of Tashlich is where we literally “throw away the things we don’t like or don’t need. Tashlich is like cleaning your heart’s closet.” I had never celebrated Tashlich until having children and joining our current congregation. I think the concept takes a long time for kids to get, but a great book like this along with the actual tossing of bread crumbs really brings a great ritual home. I especially like the idea of writing down the things that you are sorry for before going to Tashlich. Now that J is older, we might be making our own lists before heading out. Too Much of a Good Thing, by Mira Wasserman, is an interesting way of teaching the lesson that bigger is not always better. Roman King Antoninus likes things BIG and IMPRESSIVE. When he enjoys the ritual of Shabbat with his friend Rabbi Judah he wants to bring that feeling to his own kingdom. While Rabbi Judah only celebrates Shabbat once each week, he proclaims that in his kingdom it will last the whole week long. At first the villagers celebrate the chance to eat and drink, study and play everyday, but after many days of no planting, no cooking, no buying or selling, they become cold, hungry and rebellious. Rabbi Judah solves the problem by showing them how to say goodbye to the Sabbath and to make that one day of rest something to look forward to each week. In a world where it always seems to be more, more, more, it is refreshing to read a book that shows that moderation is the key. The Shema in the Mezuzah, by Rabbi Sandy Eisenberg Sasso tells an important tale for children and adults – listen to each other! The book contains a story within a story about why we hang our mezuzahs leaning to one side. As the tale goes, there once was a town where many people had mezuzahs, but no one knew how to put them up. Some wanted it standing since you say the Shema when you rise in the morning. Others wanting it lying down since you say the Shema before you go to bed. The rabbi told them that both sides were right and that the Shema tells us to listen to one another. The mezuzah should be standing up a little and lying down a little. Everyone liked that compromise and to this day, that is how you place a mezuzah on your door. Zvuvi’s Israel, by Tami Lehman-Wilzig. is an awesome book to get kids, and adults, excited about Israel. Zvuvi is a fly that takes you on a whirlwind trip across all of Israel showing pieces of the country that I never knew existed. It makes me really want to plan a 2-3 week vacation there and explore everything. J gets super excited when she reads this book, dreaming of the day when she will see the wonders of Israel. When I went in 2010 it was a wonderful trip, but I can’t wait to bring the kids there one day and explore in a different way. That trip had a very specific purpose and we were only able to see Tel Aviv and Jerusalem. There is so much more to explore. Also traveling while 5 months pregnant with a group of 10 is a challenge. Snow in Jerusalem, by Deborah Da Costa. This book was a surprise to us. It is a story about conflict, specifically between two little boys, but on a broader scope, between Jews and Muslims. Two boys from the old city are each caring for the same stray white cat. After not seeing the cat for many days, she shows up again and the boys each follow her as she travels the winding streets and crosses the boundaries between the city’s quarters. On this journey, the boys learn that peace and friendship is an option. What a great idea! Many interesting titles that are new to me here. Enjoy your celebration. I think we have you added to the jog.